UDM Downloads > AVOne RM Video Converter! Batch convert rm/ram/rmvb to avi dvd vcd svcd mpeg with NTSL/ PAL and color adjustment in batch mode and burn to DVD VCD SVCD as additional function. 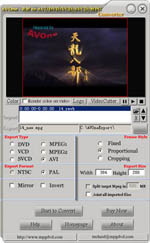 Select different AVI video codec, NTSC/PAL setting option for DVD VCD SVCD MPEG1 MPEG2 exporting. Support fixed, proportional and cropping frame for exporting video. Offer color adjustment tools including color balance and color curve tool.